I'm Scott and my wife is Beth. We've both been riding for about five years now. It took us forever to get into the sport, but now we are in deep. In the last five years we have done quite a bit of touring on the bikes. After owning several different bikes, we finally settled on a 2001 VFR 800 for me and a 98 VFR 800 for her. I started this forum because I get tired of trying to track down other Texas riders. Living in Huntsville, I don't get the chance to attend many "bike nights" in the big cities. So I hope that this board will provide a means for all of us to come together, make new friends and riding partners. And let's face it, when we've just finished the latest tweak on our bike, we can't wait to show it to people that will appreciate it. :wink: This is the place to do it. If you are going to linking to an image for displaying here, please make sure that it is less than 500 pixels wide. Otherwise it messes up the display of the entire thread. I'm working on fixing that. This's Robert a.k.a Itztli from the HSN board....!!!!! Glad to see a new board. What year is that bike? It looks brand new. Have you done any trips on it yet? I just read a review of it on this month's issue of RoadBike and they had pretty high praise for it. According to them, it is hard to beat in terms of bang for the buck. The only thing they knocked it for is riding two up because the stock suspension is not quite up to snuff for that much additional wieght. Otherwise they loved it. Although they were testing the partially faired model. Thanks for signing up. Do you race CMRA events? You look really familiar to me. I'm thinking I may have seen you at TWS in the last year or so. It would sure be a long haul for you to get up here for some riding. Maybe we can hook up in the Hill Country some time. My name is Booth, I currently live just North of Dallas. I have met and know Mr. Friday from the VFR list. I currently own an '02 RC51. It's my only bike currently because I spend way to much money on it. I've done suspension mods, pipes, PCIIIr, gearing, too much to list I guess. My last 2 bikes were a VFR800 that I miss, and a CBR929. I like to do a lot of sport riding mostly twisty stuff, we have some really great roads North of Dallas. The twisty stuff starts exactly 1 mile from where I live so I'm very spoiled. I don't care for the squidly stuff either. Well that doesn't count busting speed limits in the country I plan on another VFR800 in about a year so I can do some touring and the V5, god willing, if Honda makes it. I love to watch GP, and WSB (but not this year). I think I've been riding 5 years and I'm 29 currently. My name is Booth, ...It's my only bike currently because I spend way to much money on it. Don't we all have that problem! I love to watch GP, and WSB (but not this year). Hey everybody. Elliott, here in Dallas, saying hello. I'm still pretty new to the sport. I bought my first bike (a ysr) back in 87 and had fun scooting around the neighborhood on that for a couple of years but only, finally, got a "real" motorcycle in April of last year. Since then most of my 7K miles of riding has been commuting (as evidenced by my square rear tire ) but have gone to Arkansas and done some rides around the Denton area with a friend from work who rides. I joined the Dallas TSBA right after getting my bike and in fact bought the bike from a TSBA member who was returning to Sweden due to work circumstances. Love the VFR but the "grass is always greener" syndrome is starting to get to me and thoughts of something new have been rolling around in my head. It doesn't help that my friend from work keeps putting me on all his different bikes (RC51, R1, GSXR-1K, Hayabusa) and filling my head with lust for litre bike performance. Anyway, I'm glad to see this board up and running. I really hope it takes off and becomes a community for Texas folks to be a part of. Maybe I'll see some of you soon! Hey everyone. Clay here in Paris. I just come off a 2002 R6 and now ride a 2003 VFR. I'm 34 and have been riding street for about 3 years. Glad to have you on board. How are you liking the VFR compared to the R6? Are you planning on doing any distance riding on the VFR? Hey Scott. I talked to you over on STN. The VFR is a couch compared to the R6. I don't regret the trade one bit. And yes I am heading to the STN meet in SD. Hello from Houston. My name is Pete, obviously, but my friends call me all manner of expletives. I'm 38 years old (shut-up Booth), and first starting riding on the street about 5 years ago, with a '94 VFR750 (that I wish I would have never gotten rid of). 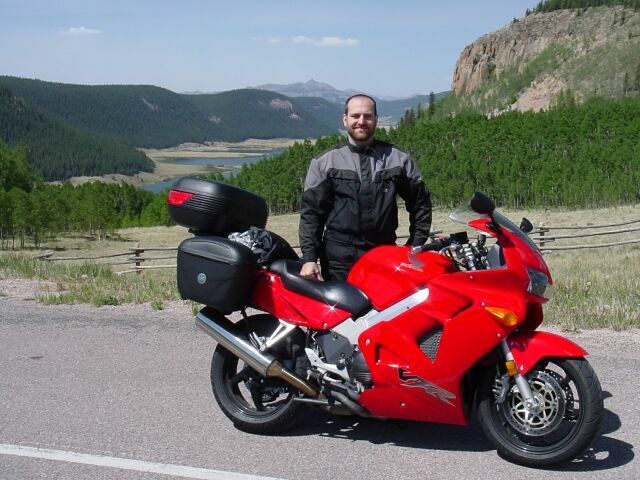 I know of Scott from the VFR List, and have always enjoyed his ride reports. 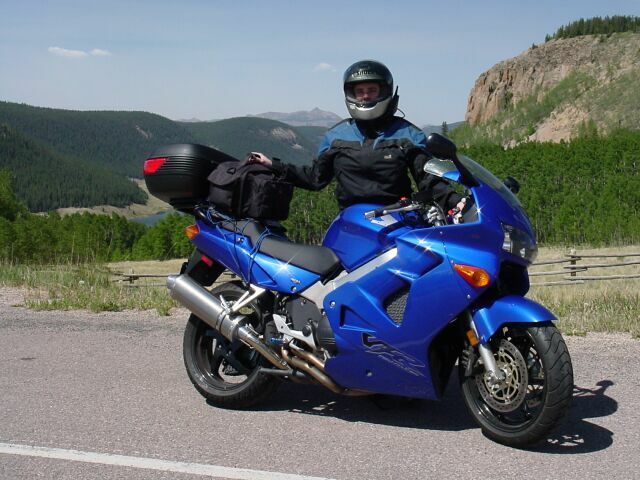 Since parting with my VFR, I've owned two CBR929s, a Superhawk, and my current bike, an '02 RC51. I'm addicted to track days at TWS, and have taken Keith Code's Level I course at TWS (that's where I met Booth). I frequent a few motorcycle message boards, namely HoustonSportbikeNetwork.com, Fireblades.org, and RC51.org. I usually ride on Sunday mornings with some friends from HSN, usually heading up to the Sam Houston Forest, out west towards Fayetteville, or northwest to Somerville. I'm really anxious to explore some of these East Texas roads that Scott is so fond of and knows so well. I'm heavily involved with my son's baseball and football teams, so that eats into my motorcycling time (but I'm not complaining, as he comes first to anything else in my life). I'm addicted to track days at TWS, and have taken Keith Code's Level I course at TWS (that's where I met Booth). Welcome, Pete, nice to see someone else who's relatively new to the addiction. I'd love to hear your opinion of the SuperbikeSchool. I was thinking of going to the Sept. one at TWS (I've never been on a track). Thanks for the welcome, Paul. As for the Superbike School, I thoroughly enjoyed it and came away with a lot of good, useful information. The class was very well-organized, the material was easy to understand, the instructors were very courteous and helpful, and their bikes were well-tuned. It was my first time on the track, and as previously implied, I chose to ride one of their ZX6Rs. I had just started riding a 929, my first FI sportbike and first liter bike, and I was a bit intimidated by it. I didn't want risk to wadding it, and if I did, it probably would have cost me more to repair it than the $750 deposit necessary to ride one of the school's bikes. I'm happy to say that my deposit was returned in full. If money is an issue for you, you may want to look into the LoneStar Trackdays track school (geared primarily for riders who have never been on a track). I took it back when they first started offering it, and it was much like the Superbike Level 1 course for a whole heckuva lot less money. I've gotten to know a couple of the instructors pretty well, and they have been a huge help to me at trackdays. Hope that helps for now, and if you have anymore questions, just ask! I appreciate the response, Pete. 2. Like you, I'm a little leery of potentially wadding my beloved bike. I'll eventually do the LSTD if I can ride the Futura there, set it up, run it, not wad, and ride it home. Money's only an issue with my wife . I didn't mean to imply I had money, only that I spend it, which drives my wife nuts, esp. when it's on "that silly bike"
Oh, and Tourm'r, I thought I did send some money your way, via PayPal . Sure you did, thanks! But I can't spend that on toys It was sent in trust for a specific purpose, to keep this forum up and running! Hello, I am Brian and am in the process (only 40 minutes left) of selling my first bike, an '85 Yamaha Maxim XJ700... wish me luck that the lucky ebayer pays Soon I will be buying a Honda VTX1300 Retro (of course if I get my money from the auction). I live in Austin and ride witha group of guy and gals, we call ourselves the Austin Scooter Tramps... Tramps for short, it sounds tougher. Thanks Scott for sending me the info on this page, I'll have to keep an eye on it and see what y'all are up to. Man that was quick, I just fired off the email a few minutes ago. By the way, the XJ was nice looking! Good luck getting the new ride, should be sweet. The Cycle World review of the 1300 this month was very positive. Welcome to the site. Welcome Brian. I had a chance to ride a VTX1300 a couple of months ago. Nice bike, comfortable with good power and nice looks, I think. Very easy to ride too. I hope you enjoy it! Welcome to the site and good luck on the Ebay transaction. I'm sure everything will be fine and you'll be on your new ride in short order. I am very new to riding. If you had asked me 6 months ago if I would be riding much less owning a new bike, I would have told you, YOU ARE OUT OF YOUR GOURD! Long story short, my husband got the bug and bought a 03 Suzuki 800 Intruder back in May. I very shortly informed him that I would not be riding on the rear of that thing. He has some experience riding but I was not ready to place my fate in someone else's hands, even though I do love and trust him completely. So he mentioned the MSF course. So OK, I'll humor him. I took the course the weekend of 7/18 and thoroughly enjoyed it. The instructor was wonderful. Got my license the following Monday and Friday bought a new 03 Yamaha VStar 650 Custom (Got it from Cycle Shack North in Conroe, Great People!). It was kind of weird the way it happened. Had gone Friday to test drive a used 98 Vstar at the local dealership after having gone there several times to talk to them about the VStar. After I rode it, I told the salesman that I wanted the bike (had gotten a price quote earlier so knew what I was looking at). The salesman then told me, oh, sorry, we sold that bike and we also sold the bike we had in the warehouse. We MAY can get you one sometime next week. Not good enough. I called Cycle Shack at 1:30pm that same day and they told me they had one in the color I wanted in a crate. They gave me a better price with a longer warranty over the phone than the local dealership gave after dealing with them several times. That is even the same place my husband bought his bike. Needless to say, we got there about 3pm and they even had the sissy bar in stock for it, put the bike together and everything and we left there with the bike by 5pm. They were great. Rode it 37 miles the first time out and was exhausted by the time got home. Death grip on those handlebars. Wind was really bad. Especially when the only riding I had done was on a Honda 125 in a parking lot for 2 days. Big Difference. The next weekend went back to Conroe and purchased a Memphis Shades 21" windshield for the bike. Made a big difference on the straight on wind but I think I notice the crosswinds a little more. Love the VStar. The main thing getting used to was remembering to put my feet forward to the controls rather than straight down like on the MSF bike. So far I've only put 115 miles on it but I hope to get a lot more practice in. The 2nd weekend I had it, I went to Target and bought soccer cones and went to the High school where the course was held and tried to reconstruct parts of the course. It is real different on a 650 versus a 125. Did manage to do the figure 8 Once without going outside the box. WOOHOO. Still, everytime with a week between rides, I can feel the adrenaline and yes a little bit of downright fear when I get on the bike. I have to pull out onto a major highway (6) which in this part of the county is known as the "DIEWAY" just to get off our road and it does take a little time until I can settle into the ride. I think this will get less with time and practice. Sorry to be so long winded but that is my story. I just found your website and forum tonight. Happened to be looking through the RoadBike mag and saw your ad for the rides and tours. Sounds great! Went there and happened to hit on your site for Texas Riders. I have looked at some others and have learned so much from reading them, thank you for starting one for TEXAS!. My Dad bought a VStar 1100 the year it came out. Very nice bike. The 650 is actually about the same size, just with the smaller motor. Still a sweet bike! Kudos for taking the time to get serious about practicing in the parking lot. Smart move. Welcome to the site. Would be nice to see you on one of our Newbie rides :wink: Keep an eye on the Upcoming events forum for rides. Welcome to the site Anne and welcome to the sport as well! It sounds as though you're going about this thing the right way with MSF and plenty of practice. You'll get more comfortable with time and miles. You picked a great bike for your first! Good looking motorcycle with enough power and a nice low, confidence inspiring seat height. Plus it's got STYLE out the wazoo! Phew! lots of replays!! ok, here I go..
Mods? Holeshot carb kit and timing advance (night and day difference), D &D slip on, Ferodo brake pads,front progressive springs (no mo' bottomin' bro). Next? some decent tires, maybe a new coat of paint in a diff color. now's black. Hang around: Houston, Spring, College Station and anywhere that's fun to ride .... I guess thats all for now..
By the way, Thanks for the card you put in my bike Tourmeister this last Sunday...great site!